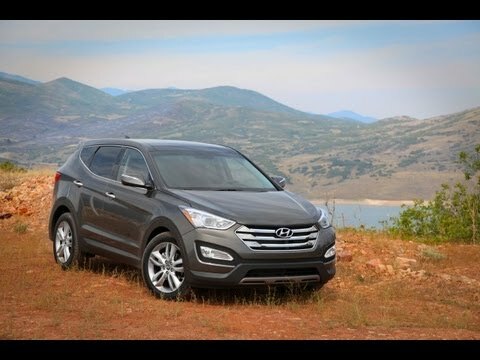 Fully redesigned for 2013, the 3rd-generation Hyundai Santa Fe retains its strong value-focused pricing orientation but adds "Sport" to its name and gains more sophisticated styling, enhanced premium features and improved driving dynamics. The upgraded and even-more-efficient powertrain choices for this compact SUV include both naturally aspirated (Santa Fe Sport) and turbocharged (Santa Fe Sport 2.0T) 4-cylinder engines. The vehicle performs wonderfully. The seats can be adjusted to custom fit for comfort. I have owned the vehicle for 5 years and other than normal wear it has been very reliable. There have not been any unexpected repairs, just normal oil changes and tire replacement.. It has good pick up and handles well. I feel very safe in the car. It rides a little higher which is great for seeing in traffic over some of the other cars. Making turns, the car performs well with smooth turns. A negative that I have is the radio. It does not have a scan button to go from one frequency automatically to another. I have to manually change to each next consecutive number. It would be more convenient and less distracting to be able to press the scan button and it goes to the next station on its own. As for blind spots, there is one blind spot that is very hindering in my vision. The panel that is between the driver side window and the front window. It is rather a large panel that is in the way of my vision. I am unable to see anything in that corner of left hand side. It is especially hard making left hand turns as it definitely impairs my view if people are in the blind spot. If three people are in the back seat, the middle person has consistently had some challenges buckling the seat belt. Not sure if it is not lined up properly or what, but it is always a factor for the person in the middle. Overall, I would definitely get this car again. It has turned out to be reliable and safe vehicle. There are rumors that the air conditions fail quickly. I believe that the majority of the "issues" that I have with my car are personal. It was my mothers car before mine so I wasn't able to pick exactly what I would like. This car is FWD which to me, is an issue. I would like an AWD car just because they are far more reliable. I also do not like the leather interior because during the hot seasons it gets very sticky. Another issue that I haven't had first hand is that the air conditioners on these cars typically go out quickly which can cost thousands of dollars. But, so far, I have only had to re load it with Freon during the summer about twice which cost me about $70. Although, I do like that the limited edition model ( what I have) has a sunroof and heated seats. This makes it very nice to drive in and comfortable. I also like the size of the trunk a lot. Very spacious. I also do like the speakers but I do believe that they could be better, but I am also 18 so I have high standards in regards to that! Santa Fe great for family of 4. My Hyundai Santa Fe is a great fit for our family of 4! There’s plenty of room for our kids’ (forward facing) car seats and plenty of room in the back/trunk area. As for car seats, we found we had less room and almost no recline ability in the front seat(s) when a rear facing car seat was in use. Overall, the Santa Fe rides very smooth and quiet, there is a bit of air drag on the front drivers side. Gas mileage is excellent, even in the city; I can average up to 28 in the city and 32-34 on the interstate. Visibility is great out the front windows. I believe the blind spot areas are difficult, as well as visibility out the back window (if looking for items below the window line) however, we have added blind spot mirrors to the side mirrors and that is been helpful. We've had no issues with heat/ac, transmission, oil, etc.. We get regular oil changes as well as tire rotations. Overall, an excellent vehicle! Hyundai Santa Fe Owning Experience : Kenapa Pilih Mobil Ini? Hyundai will notify owners, and dealers will replace the front axle shaft assembly, free of charge. The recall is expected to begin in September 2013. Owners may contact Hyundai Custom Care Center at 1-800- 633-5151. Hyundai's recall number is 112. Hyundai will notify owners, and dealers will replace the secondary latch cable, free of charge. The recall is expected to begin June 30, 2017. Owner's may contact Hyundai customer service at 1-855-671-3059. Hyundai's number for the recall is 163.